Hot summer nights. Hot summer days. Sultry summer afternoons….. Perfect for dreaming, for transformation. For the Iris in your garden, it’s the perfect time to grow, to expand, to be transplanted. The single Iris rhizome you planted last summer has transformed even in just one year, promising an even greater display come next spring. 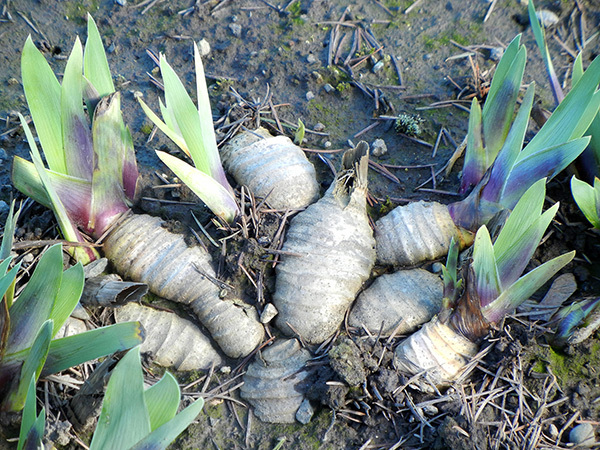 Here’s how: Bearded Iris experience two root growth cycles in their annual growing cycle. The springtime growth we all eagerly anticipate in our Iris beds begins with the lengthening of the foliage upward and the root system outward. 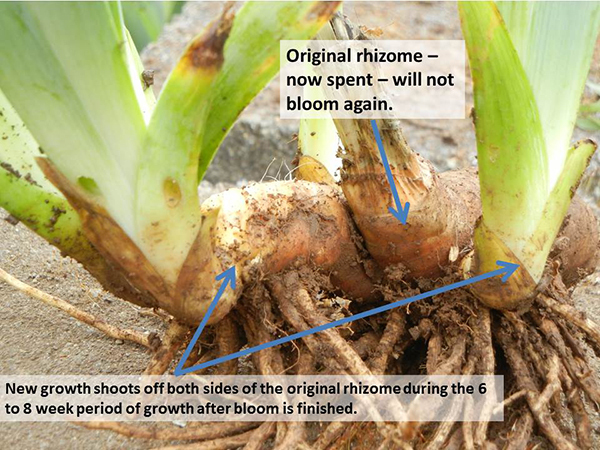 The rhizome uses its stored-up nutrients. Borrowing from Ben Hager, who writes in his chapter on Bearded Iris propagation in The World of Irises, “….as the bud swellings appear in the new fans there is a quickening of the new roots that will supply the plant with nutrients for new growth during and after bloom. The old roots from the previous year’s growth then wither and decay.” (p 314) The springtime growth of the Iris, from bud to past bloom, is largely above ground… thankfully for us gardeners who eat up the sight with our winter-weary eyes. After the color display of full bloom has passed for the year, the underground development begins in earnest. The Iris revel in the long summer days. During the six to eight weeks post bloom, the plants absorb the necessary nutrients for next spring’s growth and bloom. The rhizomes send out new increases which will become new self-contained, self-supporting rhizomes by the end of the summer. Once the summer growth is complete, the Iris takes a well-earned rest. Then gardeners eager to expand their Iris empire can begin to think about dividing older Iris clumps and transplanting the new rhizomes. The Iris rhizome has reached full maturity as the sultry July days, the dog days of August arrive; summer dormancy has set in. Here, in the Willamette Valley our Iris bloom season ends early to mid June. Therefore, at Schreiner’s Iris Gardens, we begin digging our fields early to mid-July. We are “transplanting” our Iris all over the world. On a smaller scale in your garden, consider digging your Iris to transplant if the clump is three to five years old. Overgrown clumps can lead to poor or no flowering habits, smaller and smaller rhizomes, and outbreaks of rhizome-based diseases (such as bacterial soft rot). Share the divided Iris not only in your own garden, but also with the neighbors, friends and family….garden clubs, retirement homes, 4H clubs, and so on. Remember that the latest date for transplanting depends on local conditions. Newly planted Iris require a minimum of 6 weeks to set their new roots. Thus, they should be in the ground a minimum of six weeks before the first hard frost. Consult local resources to determine the frost dates in your area. So, how do you go about digging and dividing the Iris in your garden? Visit our “How to Grow Iris” pages for more details and images on dividing and caring for your Iris! 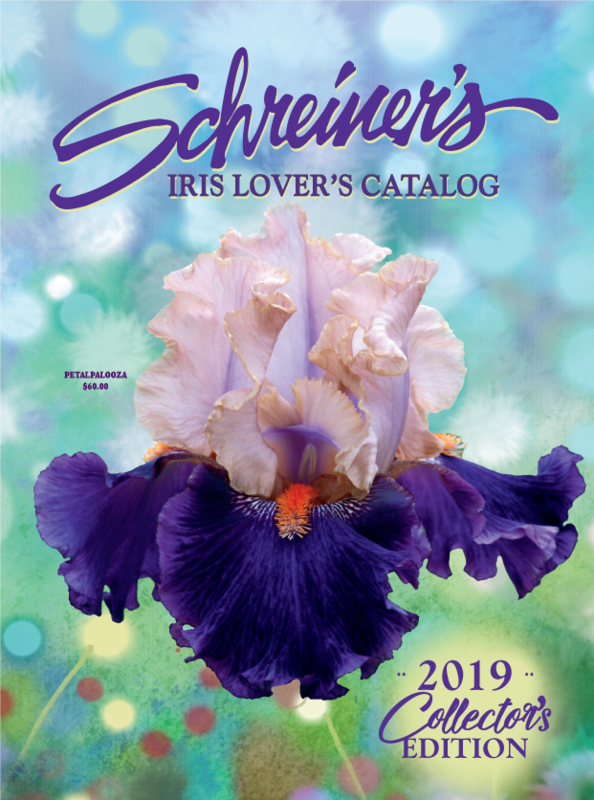 Take a look at another great Iris care resource, “A Guide to Bearded Irises: Cultivating the Rainbow“, by Kelly D. Norris. Categories: bearded iris, iris, Iris Care, Planting, rhizome, Schreiner's, transplanting iris, Uncategorized | Tags: bearded iris, iris care, Iris plants, Schreiner's Iris Gardens, transplanting iris | Permalink. Can I transplant these large iris’s as they are blooming? just after they bloom? I am moving, and may need to take some of them in mid June? Will the roots be OK/the plant live? Or perhaps I should just leave them for the next person. Hello. While it is not recommended to transplant Bearded Iris until they become dormant in the summer, an Iris lover must do what she must to keep the Iris she loves. 🙂 If you decide to dig them now or in June, they will likely survive the move. Plant them as recommended (full sun, nutritious soil with good drainage), water them in well. Perhaps provide them a dose of bone meal or low-nitrogen fertilizer to help them become established in their new home. There is a possibility that they will take an extra year to bloom again, but as long as the foliage and rhizomes are healthy and their basic needs are met, they should take well to their new home. Best of luck and thank you for reading our blog. You are welcome to contact us should you have any further questions. Thank you for reading, Barb. Enjoy the summer!